Pain is the most common reason for seeking attention in medical settings. For primary care providers and urologists alike, managing pain-associated medical conditions that are refractory to conventional treatment methods is challenging. Chronic urogenital pain that is refractory to conventional treatments (i.e., antibiotics) is common among men but not recognized widely in the medical community. Without a cure for refractory urogenital pain conditions, pain “management” must be a key word in developing patient care maps. In such cases, the biopsychosocial perspective is necessitated because whenever pain becomes chronic, a syndrome that features depression, anxiety, insomnia, helplessness, and disability is a real possibility. 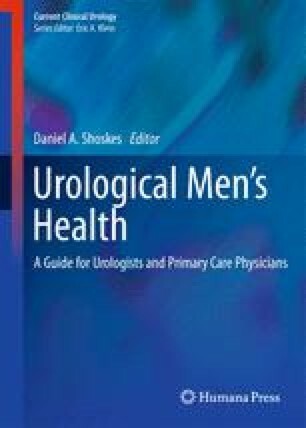 This chapter focused on the internationally prevalent male urogenital pain syndrome of chronic prostatitis/chronic pelvic pain syndrome (CP/CPPS) as well as prostate cancer. From a biopsychosocial perspective, this chapter examined pain and a biomedical model of treatment. The chapter then examined several psychosocial variables associated with poor patient outcomes in men with CP/CPPS (e.g., pain or quality of life). These data also offer clinical insights into the psychosocial management of urogenital pain conditions. Particular attention is provided for social support in this chapter. Recent data from men suffering with CP/CPPS shows that men report differences in their coping, cognitive appraisals, and self-perceived social support. Thus, interpersonal factors such as internalized cognitive appraisals of one’s ability to self-manage urogenital pain are given special attention. This chapter closes with an extension of the current discussion to the literature on prostate cancer highlighting interpersonal factors and psychosocial treatments. General concluding remarks suggest that patient care maps for men be expanded to consider social factors as well as the strong cognitive factors that may underlie the development of poor support in couples. Society AC. What are the key statistics about prostate cancer? 2011. http://www.cancer.org/Cancer/ProstateCancer/DetailedGuide/prostate-cancer-key-statistics. Accessed 5 Aug 2011.